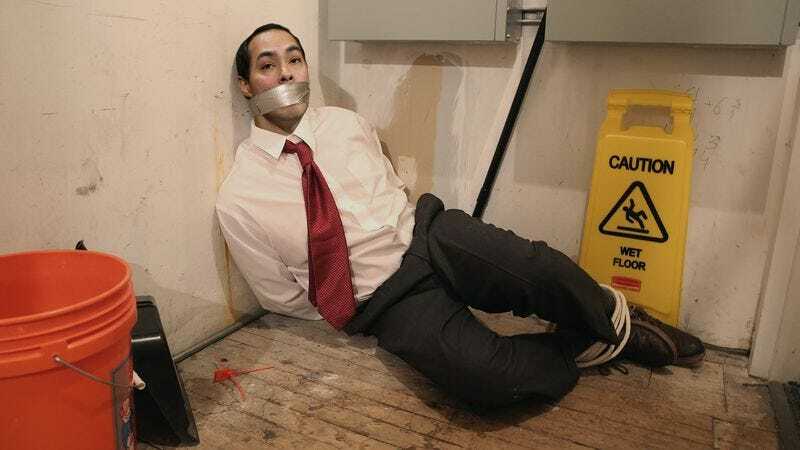 PHILADELPHIA—Struggling to free himself from the tightly wound lengths of rope binding his wrists and ankles together, bruised and gagged Texas congressman Joaquin Castro was reportedly horrified by what his identical twin brother, Secretary of Housing and Urban Development Julian Castro, might be out doing on the floor of the DNC Thursday. “Help! Help! That’s not me out there—it’s Julian!” the black-eyed, bleeding legislator reportedly shouted through several layers of duct tape from a small storage closet somewhere beneath the Wells Fargo Center, helplessly thrashing around on the bare concrete floor in panic as he imagined which party officials his brother might be speaking to and what policy positions he might be espousing at that very moment. “No, no, no! You have no idea what he’s capable of! No!” At press time, Castro was frantically trying to cut himself loose with a “Clinton/Kaine ’16” pin held in his right hand as he heard the muffled sound of his name being called over the arena’s sound system and the subsequent roar of the crowd somewhere above him.